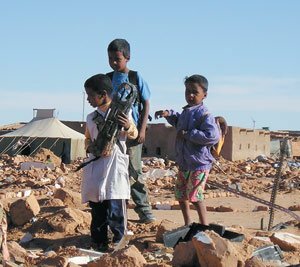 Panic has been prevailing these past days in the headquarters of the Polisario front in Rabouni. Since the announcement that a US delegation, led by President of the Robert F. Kennedy Center for Justice and Human Rights, Kerry Kennedy, will be visiting the camps of Tindouf end of August, the separatist front leaders are working day and night to clean up the place. Sources from Rabouni and other camps in Tindouf told us over the phone that the militias received strict instructions from the Polisario leader, Mohamed Abdelaziz, to leave nothing to chance. The militias went around visiting homes and ordering the Sahrawi refugees to stick to the rules, keep quiet, make no statements and avoid approaching the members of the visiting US delegation otherwise they will pay dearly for any “misbehavior”. They were also ordered to go out massively to welcome the delegation and to raise banners calling for the independence of the Sahara, the same sources said. According to the same sources, the Polisario leadership gathered over the weekend 256 prisoners and more than 100 opponents, blindfolded them and conveyed them aboard military trucks to an unknown destination, probably to one of the secret detention centers disseminated across the vast Algerian desert. In addition to this, an impressive security siege was imposed on the populations sequestered in the Tindouf camps to prevent them from rallying or leaving the camps. Plain clothes security agents were deployed in all the camps to tighten surveillance and prevent the inhabitants from organizing demonstrations upon the arrival of the delegation of the Robert F. Kennedy Center for Justice and Human Rights. Contrary to the expectations of the Polisario and its mentor, Algeria, the US delegation was not expelled upon arrival in Morocco. Instead, the visiting delegation started on Friday its tour in the Moroccan southern provinces, and its members were able to move freely and to get in touch with any of the inhabitants of the region they wanted to meet, including local separatists. What remains to be seen is whether the US delegation members will have this same privilege and be allowed to move freely across the camps and get in touch with the opponents to the separatist theses of the Polisario. Let’s wait and see.